THIS IS THE PRETTIEST ONE I HAVE EVER SEEN.IN THE REAL ! ONE OUNCE. 999 PURE SILVER. WITH UNDER 10,000 OF THESE CLASSIC COLLECTIBLE PUPPIES MINTED. PROOF-LIKE, VERY HIGH DETAIL AND LOTS OF IRADECENT COLORS. Nice Unc with an edge nick at one o-clock on the obverse. In the center it shows a male bust and under the bust it reads ADOLPH ZUKOR - PRESIDENT. On the reverse in the center it shows a building and to the left of the building it has a symbol that reads PUBLIX THEATRES and to the right of the building is another symbol that reads PARAMOUNT - PICTURES. It was struck in Gilt and an unknown rarity. It is not included in the Hibler-. Condition : UNC details (faint hairlines). "Filler" grade. It is referenced as the "State. NGC, both graded MS 61 (R-7 would probably be more appropriate). I had another copy of this. Edition (also Eglit 557). OBVERSE IS VERY NICE, AU QUALITY. REVERSE IS A LITTLE TARNISHED. MAYBE CLEANED. WE ARE NOT SURE ON THE VALUE ON THIS. It is referenced as the "State. graded by NGC. Only one has been graded higher at. Edition (also Eglit 138). It is referenced as the "State. nly 15 have have been graded by NGC. NGC has graded. 2nd Edition (also Eglit 138). It is referenced as the "State. NGC has graded 37 as HK-215. Edition (also Eglit 220 and Rulau Chi 108). Under brighter light it looks more golden which is what it really looks like. The obverse pictures President Jefferson and Napoleon and the reverse has a map of the United States with the Louisiana Territory. Chicago, IL. Also, listed as Eglit 19. Obverse designed by Augustus Saint-Gaudens and reverse designed by Charles Barber. Struck by U.S. Mint, Philadelphia. Chicago, IL. The Horticultural Building. Also, listed as Eglit 124. HK-183, Aluminum. Problem Free AU/Unc. The obverse pictures President Jefferson and Napoleon and the reverse has a map of the United States with the Louisiana Territory. Very rare to find in good condition.Would make an excellent addition to your collection. Only 1 has been graded higher at MS 65 DPL. It is referenced as the "State. NGC graded this. Edition (also Eglit 440). Known as the Souvenir Coin of Admission, it has been graded by NGC as MS 62. It has the number 1923 on the rear. Very rare to find in good condition.Would make an excellent addition to your collection. It is referenced as the "State. NGC graded this. (NOTE: The brownish triangle spot on the obverse at 3 o'clock. Edition (also Eglit 441). ). It is listed in Hendershott's 1904 World's Fair guide. This was most severe earthquake in history of United States; affected area 150 miles both north and south of city, east to Nevada and west to Honolulu. One of "wonders of conflagration" was saving of U.S. Mint Building, "where fire was fiercest," by 250 employees and soldiers. 1893 SC$1 HK-765 TYPE 1 UNDATED~R5~ CARTER HARRISON STATUE MEMORIAL FUND SCD !! Harrison was "idol of the masses" in his city. Their "instant anger and subsequent grief" at his murder "were sufficiently deep as to astonish and impress the nation.". TYPE I--UNDATED. Assassin was convicted and finally hanged. It is referenced as the "State. Edition (also Eglit 567). Gilt bronze. Advertising for TCF on back. The obverse pictures President Jefferson and Napoleon and the reverse has a map of the United States with the Louisiana Territory. No star variety! Very rare to find in good condition.Would make an excellent addition to your collection. HK-192; Problem free AU-Unc condition. Proof-like fields still evident. 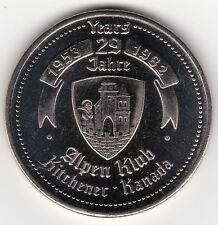 It is made of a combination of German silver and silver. Condition : UNC details (faint hairlines). Holed at top. "Filler" grade. AU condition, Veni, Vidi, Vici. 44.5mm, Aluminum. 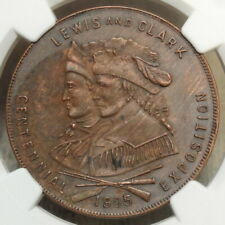 1905 LEWIS & CLARK EXPO PORTLAND OREGON, THE ONLY "OFFICIAL MEDAL" So-Called Dollar # 326. GOLD-PLATED BRONZE. Grades AU. BIDDING WILL START AT $49.95 $3.10 S&H Shipped with USPS First Class Package. Known as the Souvenir Coin of Admission, it has been graded by NGC as MS 66 PL (Proof Like). It has the number 27466 on the rear. Very rare to find in good condition.Would make an excellent addition to your collection. Struck in the standard "goldene", or as H&K puts it, "Gilt Bronze". My images do not show the color well. Check out how many have been certified by NGC and PCGS - you will be surprised. Super Rare and almost never available! Copper, 32mm. Nice AU/Unc. Blank reverse with: Whitehead-Hoag San Francisco. It is not included in the Hibler-. Obverse: A CENTURY OF PROGRESS / 1833 / 1933-4 / CHICAGO. Don't miss out on the chance to add this to your collection. It is referenced as the "State. nly 23 have have been graded by NGC. There are 2 non-PL. Edition (also Eglit 219). 38mm struck in Brass, holed apparently as made, likely for suspension on a badge. Regardless, certainly still worthy of inclusion in a collection of similar pieces similar to those listed in Part II of H-K. This would force us to raise our prices. We do realize that market values fluctuate, but if you would like an explanation of the value of any item, we would be happy to provide one. We encourage you to double-check that information independently as populations and price guides are subject to change. Round hole for suspension on a badge or ribbon. Good Luck & Good Hunting! 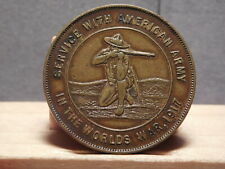 Bronze, 38mm, nice uncirculated in the used original small box of issue, Rarity-3. 1884 NGC MS63 HK-599A Middletown Centennial So Called Dollar - PQ !!! CHAPLAIN'S MEDAL SEAL BEACH POLICE DEPT. Sale!! 1906 San Francisco Earthquake/Fire, HK340a. Excellent Condition, R6.